It seems to be turning into soup month around here. I have another GREAT one for you today. Do you like hummus? If so, I’m pretty sure you’ll love this Garbanzo Bean Soup! I think it’s fantastic and a snap to throw together as well. Ok, wait…don’t run off! You’re probably thinking Garbanzo Bean Soup? Really? That doesn’t sound very appetizing! I know, I did. Every time my mom would tell me how good it is and I should make it, I was like, “nah, that doesn’t sound that appealing”. Well, its cold outside and I had three cans of garbanzo beans eating up space in my tiny pantry so I thought, why not? I’ll give it a try. I’m not sure why I was so hesitant to make it, I love hummus after all, and it’s made from garbanzo beans (also known as chickpeas). To make this soup I thought I’d use my favorite homemade hummus as my inspiration and see what all the hullabaloo was about. Boy am I glad I did. You know something’s good when you find yourself going back for “just a tiny bit more”. Yup, that was me. My intention was to start out sautéing the soup trinity…onions, celery and carrots, except that I didn’t have any carrots. I’m sure they would be good so if you have some, go ahead and try it if you like. I sautéed the onions and celery with garlic in olive oil. After they were soft and starting to turn golden, I added the spices to cook a minute or so. Then just added the chicken stock and garbanzo beans and let it simmer together for about 10-15 minutes. I used an immersion blender (perfect for blending soups and hot liquids) to blend it smooth, but you could blend it in batches in a blender if you don’t have an immersion blender, just be careful blending hot liquids as they like to explode. Better to let it cool off a bit first. Now here’s the important part. The squeeze of fresh lemon juice, drizzle of olive oil and sprinkling of sumac and chopped fresh parsley over the top of the soup is key. They bring the flavors together and add an element of freshness to the soup that’s important. The toppings take the soup from good to fantastic. It’s a VERY important finishing touch! In case you don’t know, sumac is a reddish spice, popular in the Middle East and Mediterranean region. 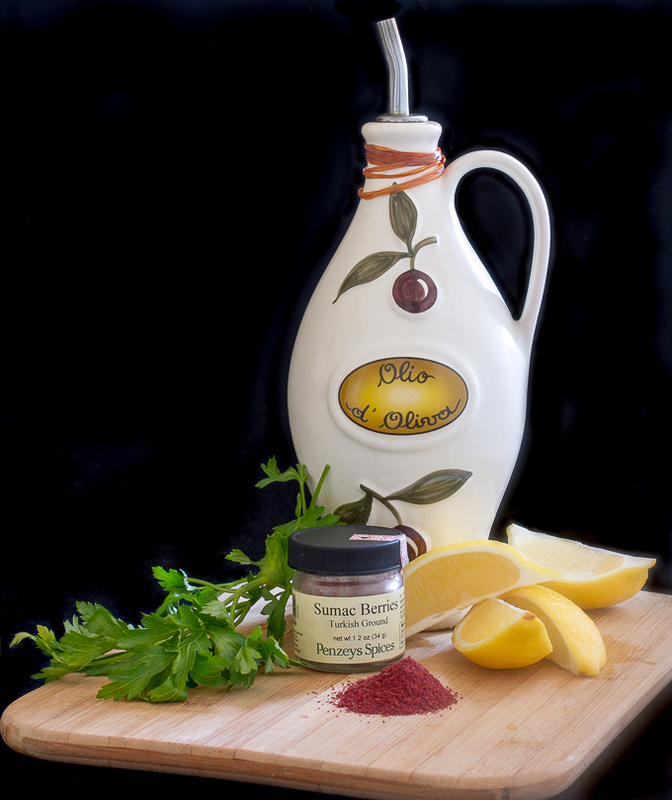 It’s frequently used as a tabletop condiment and has a fruity sourness to it. I recommend you try to use sumac if you can. Otherwise, you may substitute paprika but it’s not the same, and you might need a bit more lemon for the tartness. Finally, I’ll admit it. Garbanzo Bean Soup isn’t going to win any beauty contests (neither will my black bean soup, but it’s awesome too). It’s not one of the prettiest soups in the soup world but please don’t judge a book by its cover. It really does taste much better than it looks. And don’t forget to grab a crusty loaf of bread or some pita bread for dunking! Heat 2 tbls. olive oil in soup pot. Add onions, celery, garlic, salt (about ¼-1/2 tsp.) and several grinds of fresh ground black pepper. Saute until soft and golden. Add cumin, coriander and cayenne. Stir to combine and sauté about a minute more. Add stock, garbanzo beans, parsley and tahini (if using) and simmer about 10-15 minutes for flavors to combine. Blend soup with immersion blender or in batches in a regular blender (careful with hot liquids in a blender!). I make this soup all the time and love it. I think yours looks great and will follow your recipe from now on. I want to be sure and try the sumac and your blend of spices. I also like to dunk some crusty bread like you do. Yum! If you can’t find sumac in the store, try getting it online. I got mine from Penzys. I’m a chick pea fan so you know I’ll be making this soup. I actually think it looks pretty nice in the photo. Well done! OMG – this soup is delicious! I added the juice of a whole lemon in the batch and pureed that in as well. Thank you!